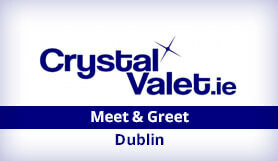 Crystal Valet meet and greet, have years of experience in providing an elite service in car care and parking. They pride themselves on their expertise, professional approach, highly trained staff, high standards as well as their continual focus on customer care and satisfaction. Concierge Fee of 20€ adding to the booking cost, enables you to Drop and Collect your car at the front door of the airport! Short Term Parking for Long Term Prices! Drop and Collect your car at the front door of the airport! Meet and greet is the perfect option if you have any mobility concerns as there are no shuttle buses or lengthy walks to the terminal. Please print out your confirmation email and take it with you when you travel. Exterior Hand Wash with Lambs Wool, Chamois Dry, Hydro Wax and Buff, Alloys cleaned, polished and sealed, Tyres dressed, Vacuum, wash and dry floor mats, Vacuum carpets, Vacuum upholstery/leather seats, Vacuum boot, Door ledges and sills cleaned, Vinyl and plastic trims polished, Windows cleaned inside and out, Upholstery, roof lining, seats and seatbelts, carpets (incl. boot) shampooed and steam cleaned, Leather care cleaning and conditioning. Exterior Hand Wash with Lambs Wool, Chamois Dry, Exterior Tar Removal, Hydro Wax and Buff, Hand Wax and Machine Buff, Alloys cleaned, polished and sealed, Tyres dressed, Vacuum, wash and dry floor mats, Vacuum carpets, Vacuum upholstery/leather seats, Vacuum Boot, Door ledges and sills cleaned, Vinyl and plastic trims polished, Windows cleaned inside and out, Upholstery, roof lining, seats and seatbelts, carpets (incl. boot) shampooed and steam cleaned, Leather care cleaning and conditioning. After you have made your booking through Looking4Parking.com you will receive a confirmation email. Please ensure that a mobile phone number has been included on your booking. You will also be contacted within 24 hours of your booking by Crystal Valet meet and greet to confirm your order and to arrange the meeting point outside the terminal. Please travel with your confirmation email and if you run into any problems please call the chauffeur number on your confirmation email. Upon your return a Crystal chauffeur will meet you at the same place and hand you back your car. If you have any further questions please call the numbers on your confirmation email. Dublin Airport is conveniently located approximately 10km north of Dublin City Centre, near the M50 and M1 motorways.